There are so many ways to make money from gardening projects. With the increased interest in gardening and eating fresh produce, opportunities range: growing plants, selling products, helping others with their gardens, blogging, and more. Here I list 36 ideas. Some require strength, some require tools,but many don’t. 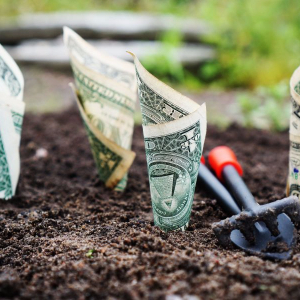 No matter your abilities and living situation, there are likely ways that you could come up with some gardening income. I’m not writing about gardening jobs here, though they do exist too. Some of these ideas are gardening-related rather than specifically requiring you to get out into the garden. I’ve added links to other websites and to books that discuss making money from gardening. For vegetable gardening books, a good place to start is my blog post The 10 Best Vegetable Gardening Books to Buy Now. Speaking of blog posts, I did a short one back in 2009 titled Money from Your Garden. Where would you sell? Directly from your garden or a stand out front, at Farmers’ Markets, at food coops, and nurseries, and online at places like Amazon and eBay. You could also go around to local Bed and Breakfasts and restaurants and see if they would regularly buy specialty items from you. Craigslist could work if you don’t mind the public coming to your place. Check out the costs before deciding; for example, some Farmers’ Markets charge more than others. I won’t go through where each of the ideas below would best be sold, as in some cases it’s obvious and in other cases it’s versatile. Get Rid of Poison Ivy or Poison Oak… For a Good Price! In growing any kind of plants that you intend to sell, the question of whether you will grow organically comes up. Of course I hope you will, as that is essentially how I have gardened for decades. Do know that to sell garden produce and have it certified organic can be quite an expensive and time-consuming process. Fortunately, if you earn under $5,000 in a year from sales of organic products, you are exempt from needing to go through that process, according to this helpful article. So it depends… many organic growers and sellers who earn more than that do not go through the process either. They can’t use the USDA seal, but they can tell their customers how they grow. Growing starter plants can work especially well if you have (or create) a greenhouse or some cold frames to get a jump on the seasons. Having specialty plants, organically grown, adds value. My favorite place for getting really good heirloom seeds is Baker Creek Heirloom Seeds at rareseeds.com. We’ve grown a lot of things from them, and my favorite is a squash called Zucchino Rampicante. This little photo shows it wrapped around my neck, an image that was on the logo of this site for quite a while. It’s an Italian squash. As with starter plants, you are likely to do best with specialty vegetables. Microgreens, mixed greens, garlic, peppers, snow peas, and mushrooms are some ideas. Unusual tomatoes and cucumbers too! Not every plant you grow will sell. This will give you veggies to use up at home, give to friends, or give to people in need. I came across a website that offers a free email course called The Tomato Freaks’ Guide to Choosing, Growing, and Selling High End Tomatoes. That page has so many pretty pictures of tomatoes that it took me a minute to find where to put my email address… it’s not far down on the right sidebar! The lessons are worthwhile. When we lived in Colorado, quite a few of our neighbors were growing pot to sell through the legal dispensaries there. I think it was pretty easy to grow, though occasionally someone’s crop would be stolen. Here is a bestselling book on Amazon.com: Marijuana Horticulture: The Indoor/Outdoor Medical Grower’s Bible. it doesn’t take a lot of space to grow flowers, and here is a top book on how to do it: Floret Farm’s Cut Flower Garden: Grow, Harvest, and Arrange Stunning Seasonal Blooms. If you are a “people person” you could develop a business selling flowers for birthdays, Mothers’ Day, and other special times. Back in the 70s, my husband Kelly and I bought an old summer camp in northern California with two of his sisters and their husbands, and we all lived there together for some years. (Here’s a blog post I did about it: Sunshine Camp Revisited Because of the Internet). Anyway, I remember that at least one year we made the money for the property taxes on the place by selling most of the persimmons from a prolific tree. You can see a few that we missed in the upper left corner of the photo. My brother-in-law Roland worked in San Francisco and he sold the boxes at our feet to a health food store there. 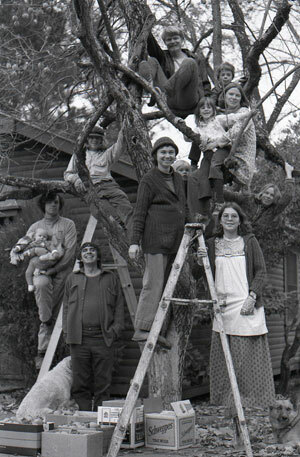 We used this photo for a Christmas card one year… I’m on the ladder which is held by our friend Wendy Bloom. Kelly is the highest up the tree, and the rest of the family is scattered around the tree. So that’s one way to sell fruit, a quirky example. There have got to be many easier ways to sell fruit you’ve grown. But this does exemplify the concept that you never know where opportunities to make money from gardening will turn up! A friend of mine once had a business of growing alfalfa and other sprouts. As I remember, she used two-quart canning jars and she had a regular customer, an organic foods store. She may have had other customers that I have forgotten, but I do remember watching her rinse jar after jar. It was a lot of work. I don’t think she had a commercial kitchen, which might be required now to sell sprouts other than informally. If you grow heirloom plants, you might be able to sell their seeds. You would have to be careful not to grow other varieties of the same thing (like tomatoes, for example) anywhere nearby. Because of that, I think this would be less lucrative than many of the other ideas on this page. We save a lot of seeds for our own use and sometimes we do get some odd combinations in the resulting plants. Jams, jellies, curries, pickles, and other home-canned goods show up at holiday fairs, Farmers’ Markets, and other places. In some communities, you are required to use a commercial kitchen. In our area, I know of at least one commercial kitchen that is available for people to use. Kelly makes delicious fruit jams in our bread machine. He skips the pectin, uses very little sugar, and comes up with great combinations. The other day it was mulberry jam from our mulberry tree, and more often it’s rhubarb-strawberry from the garden. He also makes jams that combine rhubarb and frozen fruit from the grocery store. He doesn’t sell any of these but I’m sure our friends would line up to buy them! Herbalist Rosemary Gladstar has changed the practice of American herbalism during her over 40-year career. She began her work in herbalism in California, where after study she founded the California School of Herbal Studies in Forestville, California, in 1978, which was the first herbal school in California. I often pull out her book Rosemary Gladstar’s Medicinal Herbs: A Beginner’s Guide: 33 Healing Herbs to Know, Grow, and Use. Another good one of hers is Rosemary Gladstar’s Herbal Recipes for Vibrant Health: 175 Teas, Tonics, Oils, Salves, Tinctures, and Other Natural Remedies for the Entire Family. Dried flowers are a good thing to sell, locally or online. For example, when I did a Google search on dried flowers, one of the first sites to come up was Etsy.com, where quite a few listings showed dried flowers… see Etsy.com/market/dried_flowers for pages of examples! By the way, don’t worry much about competition. Seeing a lot of listings there means to me that there is a lot of interest too! What flowers to grow for dried ones? Here’s a chart. How to dry them? Here is a well-illustrated article. Garden gnomes and fairies, statues of Saint Francis and more… there are many decorative items that handy people could make and sell. 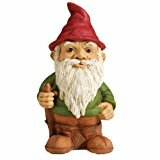 This cute little gnome is about a foot high and is made in China. Hmm, not easy to compete with the Chinese on prices! If you are handy at woodwork, there are also benches, trellises and more. If you are going to be shipping large items, that has its own challenges. Still, there are possibilities here. I’m thinking here of things like t-shirts with garden designs or sayings on them. You could sell at Zazzle.com or similar sites. At those sites you wouldn’t have to do the creation, just the design. Or you could sew leather aprons with pockets, if you researched the competition (the Chinese again…) and thought you could make a profit. If you could find fabric with attractive garden designs on it, you could make aprons or tote bags or clothing. We have a friend who sells a natural soil improvement at our local Farmers’ Market. In talking to people there, he also gets jobs going out to evaluate gardens. Digging garden beds, especially for the first time, is hard work. It requires a strong body and a good sharp shovel. I’ve done it but I’m not doing it anymore, and there are lots of people like me. (That’s one reason I like container gardening.) Just don’t take on too many jobs in the spring! Preparing the beds in other years is not as hard. Actually putting the tree into the hole that has been dug is the fun part. Digging a truly deep hole? Ah, that could be where you come in. But once you’ve dug the hole, you may as well plant too. We have some friends who have traveled around the United States installing geodesic dome greenhouses. You could install greenhouses locally. Cold frames too. The image here is the cover of a best-selling book on installing solar greenhouses and using them. When I first met my husband Kelly, he was living on the windy California coast and gardening in a greenhouse he made from a surplus-store parachute. It tore to shreds after two or three years but we got a lot of good eating out of it before that happened. We’ve since had greenhouses and cold frames, and they always extend our growing season very nicely. Mowing lawns used to be the mainstay of many a teenage boy’s income. I wonder if that is still the case. Anyway, there is income there. Also, if you are doing other garden jobs for someone, weeding could come up as well. Some seniors can still do it all… I’m lucky enough to be married to one. But there are plenty of seniors who can do part but not all of the work of gardening. They may want to do everything they can and leave the hardest parts to you. This could also be case for people with bad backs and other physical or time challenges. Oh man. I would not do this. If you would, ask a premium price, wear old clothing (or disposables) you can put in a plastic bag in the trash. Get yourself some Tecnu first. This stuff has saved my sanity by reducing the itching, even getting rid of it! The link goes to a list of Tecnu products. How to design a garden? It depends on the goals, whether for beauty or productivity, for example. If you are good at this, there is going to be work. In person or by phone, fee per time or per month… if you are something of an expert! Compost improves the soil so much. If you have a large enough garden to make compost, you could sell it. If you could bear to part with it, that is. Worms are a great way to compost. We’ve been doing it ourselves for almost two years now, using this worm bin and starting out with about a thousand worms. It’s worked great. We haven’t sold any of the results the worms give us, as our garden needs it all, but I’m sure people would love to buy it! So you could either sell a worm setup or you could sell what they make. Whether any of these events would interest you depends of course on you, but it also depends on what your garden is like and whether there are any regulations where you live regarding having events for pay. If there are particular gardening subjects that you are good at, you could have classes on them. Or you could have general gardening classes. They could be one-time things or weekly for say 6 weeks. If you have a pretty garden and yard, and enough parking, you could use it for social events. For weddings, you would need to make the space available for a rehearsal as well. Community supported agriculture is a lot of work and requires a lot of organization. That link goes to a Wikipedia article which points out that farmers often undervalue their contributions. It’s a great service, in any case! This would give you some local recognition or notoriety, so would be a good tie-in if you were selling agricultural products or services. There are a gazillion garden blogs, but there is room for more. Readers enjoy reading garden blogs that are local to them or that are about the particular gardening topics that interest the readers. Could be organic vegetables, could be tomatoes, could be orchids, could be… You get the idea. If I weren’t such a dedicated generalist (ahem, if I weren’t so scattered), this site would be more of a gardening blog, but as it is, you can see my gardening and homesteading category here. Write about what you do in your garden, with photos. More than most subjects, you need photos of the garden. How to make money blogging is a huge topic in itself… Since I’m such a fiend for books, that is probably the most common way that I make money, through Amazon.com links. There are lots of other choices too. If you like to write and have a special expertise within gardening, you can write books. They can be for the Kindle or paperbacks, ideally both. There is a lot of information online about writing and self-publishing books… we haven’t done it for gardening but both Kelly and I have Kindle books and paperbacks up on Amazon.com… we create them in various programs. You can use Word. Then we make PDFs which we upload for the paperbacks and transform to the right format for Kindle ebooks. So assuming you have a computer or even a good tablet, it doesn’t cost much to write and self-publish a book. Then you will have to learn to promote it, but Amazon.com is good at that for books that show some popularity. If you can take good photos, you can explore selling them online. Here is a list of stock photo places to apply to. If you are an artist, you may already know about a variety of ways to sell your artwork, such as local places where you live and Etsy and Zazzle, both mentioned above. For art specifically related to gardens and gardening, do some internet research and see if there are websites about gardening that might want to use your artwork for a fee. If you have a website, offer your art for sale from it too. 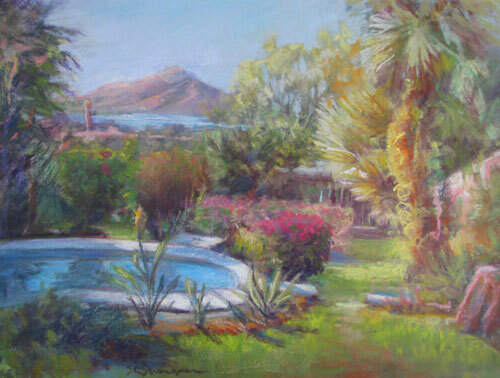 When Kelly and I sold our home in Mexico after living and gardening there for five years, we happened to sell to an American artist. We paid her for this view from our front porch. It’s in a prominent spot in our living room, and yes, sometimes it does make me homesick for Lake Chapala, which you see in the distance. Profitable Plants is the name of a website I found where they sell $19 downloadable garden guides on how to grow various plants… herbs, garlic, other things. They will include a guide on how to sell your plants if you buy one or more of the booklets, and if you click on the cover of a free ebook called Specialty Crops for Small Growers it will download automatically, no need to give them your email. I did this, and they had some things that hadn’t occurred to me as cash crops: lavender, bamboo, ground covers, and more. Here’s a website I happened to come across where they have a program to help you make money gardening part-time or full-time. It’s more expensive but they do have a money-back guarantee for a while. That link goes to their page discussing making money from your garden. 53 Ways to Make Money from Your Garden Besides Selling Produce — this is on the site where I mentioned the free tomato ecourse. I picked up a couple of her ideas for my list here. I enjoyed this long conversation about gardening income among gardeners on a forum, started by a woman who suffers from anxiety and loves to garden. 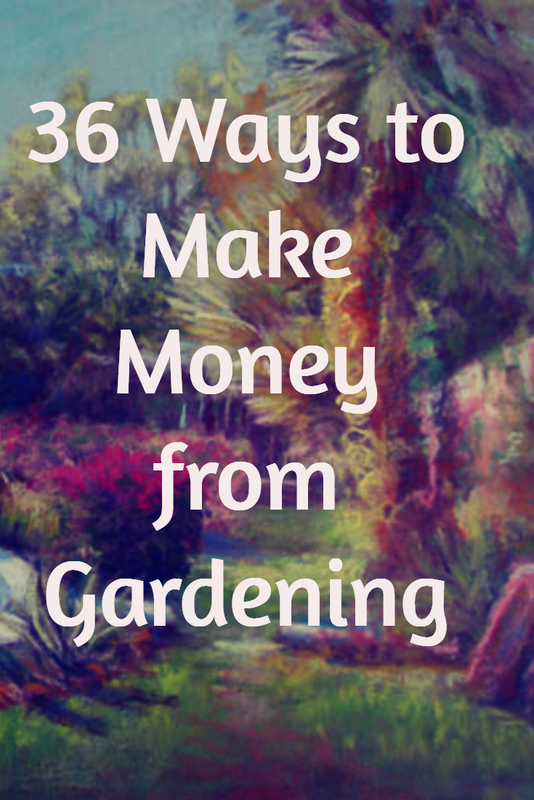 So is making money from gardening for you?